From the Deadpool collection by Plasticolor. 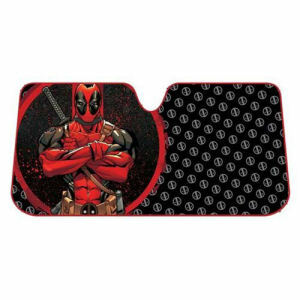 Deadpool Repeater Accordion Bubble Sunshade. From the Deadpool collection by Plasticolor. Deadpool Repeater Accordion Bubble Sunshade. Measures approximately 58 inches wide by 27.5 inches tall. Plasticolor Deadpool Automotive shipping from Canada. No Surprise Border fees or Customs!